Not long ago I spent a few days in Barcelona. 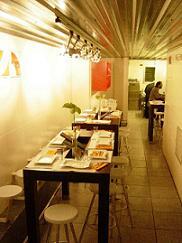 Although my work schedule was pretty hectic, we managed to squeeze in a memorable dinner at Cata 1.81 in Eixample. Great wine, countless miniature courses of delicious morsels, and effortlessly stylish surroundings that put to shame New York”?s wannabe Barcelonas [insert your favorite recently opened Lower East Side eatery here]. A great fast food solution in Barcelona was lunch at a humble Equadoran joint (c/ Calabria, near Gran Via, also in Eixample). They served wonderfully fresh avocado salads and ceviches. In fact, I”?m totally obsessed with ceviches. The perfect summer food, they are a staple at Ecuadoran and Peruvian restaurants. My last week in New York was devoted to eating food I’ll miss the most, so one of my last meals there naturally involved a Peruvian salmon ceviche. Peruvian food belongs among my all-time favorite cuisines, but I”?m not counting on finding too many Peruvian restaurants in Northern Europe. Hence, I”?m seriously contemplating buying this cookbook. When leaving New York a month ago, my bags were bursting with pisco, ají amarillo, mote blanco, and maiz de tostar from the Trade Fair supermarkets in Queens. Luckily, a lovely check-in guy at JFK waived the excess weight charges (30kg/ 66lbs “? a fortune) when he realized how terribly I will miss all the great food I used to be able to get so easily in Astoria and Jackson Heights. (Now that I read about the week-long ConEd power failure that affected one of my favorite haunts in NYC, I’m of course totally horrified, but also smugly happy that I barely managed to escape). Let’s hope the power stays on as I make this batch! A ceviche involves raw fish or shellfish chemically “cooked” by citric acid. I keep it in the fridge overnight or for at least 8 hours. Ceviche is usually served on a leaf on lettuce, with a cold sweet potato and an ear of corn (or a few tasty, oversize kernels). A few weeks ago I prepared a shortcut version of all this to my husband and a friend “? tasty, light, wonderful, highly recommended. Yesterday, I had another ceviche for lunch at work. Somehow I managed to spill ceviche juices all over the place during my bike ride to work, so I smelled strongly of fish for the rest of the day. Cut the fish into bite size pieces and place in a bowl. Pile onions on top of it, and pour citrus juice all over it. Season with salt, pepper, and vinegar. Let rest about 6 hours in refrigerator. Heat oven to 200 C (425 F). Halve the potato lengthwise, then cut each half into 7 slices. Place them on a baking dish, toss with oil, salt, and pepper. Bake for 10-15 minutes. Flip the potatoes over and bake for another 10 minutes, or until tender. Wrap one ear of corn in parchment paper (the husks can stay on), microwave high for 3 minutes (5 minutes if you make two at the same time). Peel, serve hot with a knob of butter. O, how lucky to go to Barcelona! I went last year and had such a wonderful time! I especially loved all the architecture from Gaudi and the Barri Gòtic…! I”?ve as well just started a foodblog – TastingLife. I really hope you’ll check it out sometimes! I’m looking forward to reading more about Peruvian food on your (and your pikkuveli’s) blog! I know (close to) nothing about this cuisine, though hear good things from my Peruvian aquaintances. Hi sis, I tried the citric acid “cooking” today when I impulse bought a whole whitefish (siika for Finnish speakers). I kept the fish in the marinade for three hours, and it was to die for. Yummylicious!!! Prepare the marinade first by combining the ingredients. Cut the fish fillet into thin slices. Pour some marinade in a shallow dish, lay the fish slices evenly, pour some marinade and prinkle with salt. Lay another layer of fish and repeate. Refrigerate for ~3 hours until the fish has turned opaque. Does it make any difference if you take the fillet from a big or a smaller fish? I’ve heard some people say the smaller siika are better. Are there any “rules” for buying whitefish in Finland….? What should I be looking for? I’m a bit worried about buying Baltic Sea fish: I’ve read in the paper recently that the sea is really badly polluted…. Hi Penelope! Typically younger fish are tastier, but then again bigger fillets may be easier to prepare. Lately I’ve been cutting the fillets into nice bite size pieces instead of slicing them really thin. This way you can keep them much longer (12-24 hours) in the marinade without a fear of over cooking them. Personally I’m not worried about the baltic fish: health officials say that it’s safe to eat it in moderation (i.e. 1-2 times a week). If you’re really worried, buy e.g. Norwegian salmon that grows in the Atlantic. Since ceviche is not cooked, I would follow the same rules as when making rawpickled (salted, graavi) fish: use salt water fish as freshwater fish may have parasites which may not get killed because of the lack of heat. Thanks for mentioning pangasius. I’ve bought ‘pangas’ from Stockmann couple of times, and have been wondering what’s the English name is. No I know! 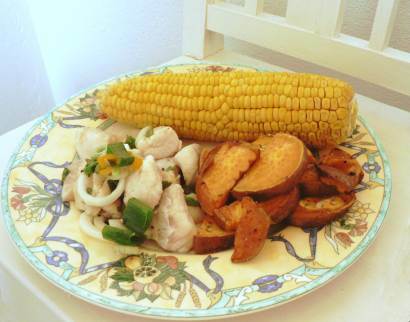 What other fish species could you use for ceviche? And is the recommended marinating time different for different fishes?